Randell Adjei is a professional spoken word Artivist & Edutainer who uses the spoken word to empower and create community through Edutainment. He is the founder of one of Toronto’s largest youth led initiatives; Reaching Intelligent Souls Everywhere (R.I.S.E Edutainment). The beat of his Art was found after years of being lost. He found himself by turning his struggles around to inspire others. 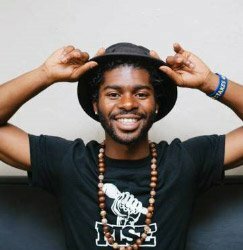 Randell is also an Inspirational Speaker, Community Organizer and a MaRS DD – Studio Y Cohort 2 fellow. He is 1 of 4 coaches involved in the PAN AM/Toronto Public Library (Poetry Saved Our Lives) project.